In July 2015, Peterborough Cathedral’s 1894 Hill and Son organ was dismantled and taken to workshop to be re-pitched from ‘Old Philharmonic’ to ‘Standard’ concert pitch. This complex operation took 18 months. By February 2017 the old instrument was back in situ. To mark its return, artist Bettina Furnée and writer Lucy Sheerman devised an extraordinary multi-disciplinary collaboration with the composer Cheryl Frances-Hoad based on those two naturally overlapping (?) phenomena Evensong and space travel. The present disc incorporates Frances-Hoad’s 52 minute musical contribution to this event, the oddly but appropriately titled Even You Song. It is useful to consider the unusual premise behind this work before discussing the music. The structure of the ancient ceremony of Evensong underpins the entire idea. The newly -restored organ acts as a kind of ‘lift-off’ point. The text is a combination of liturgy, readings, and a ‘libretto’ based on a series of interviews with twelve couples from the Peterborough area who were each asked to muse on the possibility of travelling to the Moon together, and to consider their apprehensions about such a journey, the practicalities involved, the possessions they would take with them and leave behind and so on. The ‘art’ involved moonlight lighting, digital film projection and to symbolise the ‘earthbound’, photographs of the household interiors of the interview participants. One of the problems with an extraordinary ‘one-off’ community event like this is that the created work fails to outlive it, and so it becomes a pièce d’occasion. To circumvent this happening to her music Frances-Hoad incorporates a Magnificat, and Nunc Dimittis, in the hope that they will be absorbed into the liturgical repertoire and thus have a life beyond the event. The other point to be made about this unique collaboration is that the music provided the opportunity to involve choirs from four local schools as well as the Cathedral choir. One of the considerable attractions of the music is that at no stage does Frances-Hoad hold back, or ‘talk down’ to these young singers. Their parts are at times extremely challenging. They cope quite splendidly. My MWI colleague Robert Hugill attended the event and provided this vivid review on his own website. Having had the opportunity to hear this disc I have to say I am rather envious! Even You Song begins with an organ voluntary ‘Where does your faith lie?’ This moves from darkness to light – its opening brought to my mind the first bars of the ‘De profundis’ from Honegger’s Une Cantate de Noël. After a ‘Pater noster’-type prayer read by the Minister (and answered by the congregation of performers) the brief ‘Preces’ section presents the conceit of the entire work, as the cantor intones questions along the lines of “How would it feel to go to the moon?” and a semi-choir provide pithy responses. The text of the ‘Psalmody’ reflects on the questions we ask, often as children, about the world beyond. This starts with an ethereal organ phrase before unison choirs and solo voices sing the setting. Don’t be fooled by the unison – rhythmically this sounds tricky to negotiate. The children’s choirs were evidently superbly prepared by James Bowstead, the organ scholar at the cathedral. Gradually tricky harmonies emerge. This movement is superbly built. A lesson is then read to the congregation – it’s adapted from Genesis I and is eminently, and delightfully comprehensible. The longest section of the work is the ten-minute ‘Anthem’. The word ‘Anthem’ scarcely does justice to this extraordinary movement. Let me quote Ateş Orga’s pithy description from the notes, which gives something of its flavour (and is worthy of a setting for unaccompanied choir in itself): “…a dramatized aggregation of solo star-glints, mass tuttis, homophonic fields, pianistic organ figurations, dissonances, Lydian tones, unpitched sounds, rhythmic mischief, the aleatorically unpredictable, Schumannesque fade-outs” Ultimately this melange convincingly evokes the silence of space, the sound of one’s heart-beating (most tellingly in the weird organ-pedal accompaniment), running water and radio-waves; there is blowing, tongue-clicking; whistling and lots of whooshing. It shouldn’t work, but it certainly does in this context. It must have been incredibly challenging but great fun to perform. The following ‘Hymn’ is superb, uplifting – one of those one would have looked forward to singing in school assembly. It summarises the essence of the work in four succinct verses. The tune is an earworm – but one this listener is happy to carry around . The organ part is imaginatively beautiful and the descant mesmerising. If this had featured in the old A & M hymn-book one can only imagine the hymn-tune would have been called ‘Ad Astra’. All that remains is the upbeat closing organ voluntary ‘Taking Your Leave’. This is suffused with appealing toccata-like figurations – after a fade to seeming inaudibility the work ends on a crashing C chord. Listening to this for a third time I really wanted to applaud. It must have been a pretty unforgettable experience to have been in the audience, even more so to have been among the performers, who excel. The whole edifice is kept upright by Peterborough Cathedral’s Director of Music, Steven Grahl who manages his diffuse forces with seemingly total confidence. Ultimately this recording can only really capture the sound, and that it does admirably. But it goes way beyond being a mere souvenir of a unique event. 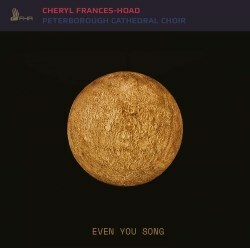 As ever, Cheryl Frances-Hoad’s music is frequently challenging, always original and sometimes deeply moving. The whole undertaking seems to have been an unqualified success, and I wholeheartedly commend this disc to one and all. Allow me to conclude with a related teaser for any true anoraks out there: Googling not allowed. (There are no prizes…just the warm glow of superiority if you know). What unlikely characteristic does Penderecki’s Symphony No 1 share with Even You Song?